Food Costs > How Much Does King Crab Cost? How Much Does King Crab Cost? Known as the true “king” of the Alaskan waters, king crab is known for its meaty legs and claws, but even though it’s the king of the Alaskan waters, it can also be found along the coasts of Russia, South America and Japan. These crabs are celebrated for its size, tender white meat and every day, fisherman risk their lives bringing home a catch. How much does king crab cost per pound? On average, plan on spending anywhere from $30 to $55+ per pound. This price will depend on the time of year, the size, where you live and where you’re purchasing it from. On the east coast, for example, the costs could be much cheaper than someone who lives in the middle of the United States. At Costco, for example, you can purchase a 10-pound box for around $300, while Sam’s Club sells one-pound packages for about $35 per pound. ChowTimes.com wrote a guide talking about how you should buy an Alaskan king crab. According to the article, the offseason price would be around $30 per pound, and with each crab weighing an average of five pounds, your cost could be close to $150. However, during the AKC season, which was from late February to late March, the prices could drop to as low as $10. When purchasing king crab, it will be graded in sizes that indicate how many legs will create 10 pounds. The number 9/12, for example, will mean there will be nine to 12 legs in a 10-pound container. You may also see other terms, aside from king, such as large, extra large, colossal or even jumbo While there is no industry standard size, according to CaptainJacksAlaska.com, the size terms used by companies selling jumbo crab legs will be graded by the processors. These sizes will include 6/9, 9/12, 12/14, 14/17, 16/20, 20/24 and 24/+. There are three varieties of king crab: the red king, golden king and blue king, and the name “king” brought all three of these varieties together due to the size. According to this Fox News article, the most prized is the red king, which can span over five feet and can weigh up to 24 pounds; however, the average weight will be 10 pounds or so. A close second, according to the article, will be the blue king, which is slightly smaller, but when cooked, it can turn red, often resembling the popular red king crab. The smallest of the three, the golden king, will be the smallest and will offer the least amount of flavor. King crab season will kick off on October 15 every year, the time when fishermen are legally allowed to fish. King crab purchased at local retailers will often be wild caught from a natural sea unless specified and should be fully cooked so you can eat it either raw or cooked. If purchased online, you may have to pay another $10 to $25 in expedited shipping fees. If making a purchase online, some retailers may require a minimum order. According to our research, we had found many online seafood markets required a three to a five-pound minimum. 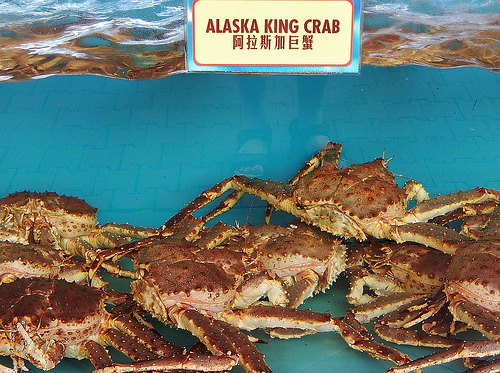 Only crab legally caught in Alaska can be labeled “Alaskan king crab.” If it doesn’t say “Alaskan” on the product, pay close attention to see where the crab was harvested. Buying in bulk at either a local wholesale club or fish market can often bring the costs down by as much as $5 to $10 per pound. It was the best price there!